The aim of the present study is to evaluate health hazards to humans from the radioactivity in rocks and soil in intraplate volcanic fields of western Yemen. The details of natural radioactivity data in rocks and soil ( 226 Ra, 232 Th, and 40 K) and their radiological hazard as radium equivalent activity, representative level index I r, external hazard index Hex and dose rate for intraplate volcanic field located in western Yemen, near Sana'a, which is one of such four intraplate volcanic fields in Yemen, are presented in this study. A total of 18 rocks and 14 surface soil samples were collected randomly from the study area. Rock sample was crushed into small pieces and ground to a powder. Soil samples were collected with the only constraint that no sampling site should be taken close to a field boundary, a road, a tree or other obstruction. Surface soils were then taken from different places randomly within the marked and cleared area from the ground surface up to 2 cm and mixed together thoroughly in order to obtain a representative sample of that area. Each sample (rock/soil) was dried in an oven at 105°C and sieved through a 100 mesh which is the optimum size enriched in heavy mineral. The samples were packed in plastic containers with dimensions of 75 mm diameter and 90 mm height. The samples were weighed and stored for a minimum period of 1 month to allow daughter products to come into radioactive equilibrium with their parents 226 Ra and 232 Th and then were counted for 480-720 min depending on the concentration of the radionuclides. Each sample was measured with a gamma-ray spectrometer consisting of a high purity germanium (HPGe) setup and multichannel analyzer 8192 channel. The detector used has a coaxial closed end, and a closed facing window geometry with vertical dipstick (500-800 μm). The HPGe detector is of p-type with the following specifications: Resolution [full width at half maximum (FWHM)] at 122 keV 57 Co is 1100 eV and at 1.33 MeV 60 Co is 2.00 keV - relative efficiency at 1.33 MeV 60 Co is 30%. The detector is shielded in a chamber of four layers starting with Plexiglas (10 mm thick), copper (30 mm thick) lead (100 mm thick) and finally cadmium (3 mm thick). This shield serves to reduce different background radioactivity. The emitted X-rays from lead, which contain radioactive impurities due to antimony, can be absorbed by lining the inside of the shield with a graded layer of 0.05 inch cadmium and 0.25 inch perspex. To minimize the effect of the scattered radiation from the shield, the detector was placed in the center of the chamber. Then the sample was placed over the detector for at least 10 h. The spectra were either evaluated with the computer software program Maestro (EG and G ORTEC) or manually with the use of a spread sheet (Microsoft Excel) to calculate the natural radioactivity. 226 Ra activity of the samples was determined via its daughters ( 214 Pb and 214 Bi) through the intensity of the 295.22 keV, 351.93 keV for 214 Pb gamma lines, and 609.31 keV, 1120 keV, 1764.49 keV for 214 Bi gamma lines. 232 Th activity of the sample was determined from the daughters ( 228 Ac), ( 212 Pb) and ( 208 Ti) through the intensity of 209.25 keV, 338.32 keV, 911.2 keV, 968.97 keV gamma lines for ( 228 Ac), ( 212 Pb) emissions at 238.63 keV and ( 208 Ti) emissions at 583.19 keV, 2614 keV gamma lines. 40 K activity was determined from the emissions at 1460.7 keV gamma lines. where ATh is the specific activity of 232 Th in Bq/kg, ARa is the specific activity of 226 Ra in Bq/kg, and AK is the specific activity of 40 K in Bq/kg. where ARa, ATh and AK have the same meaning as in Equation (1). where ARa , ATh and AK are the activity concentrations of 226 Ra, 232 Th and 40 K, respectively. The calculated average external hazard index was found to be less than unity. where ARa, ATh and AK are the mean activity concentrations of 238 U, 232 Th and 40 K, respectively, in Bq/kg. Beck et al. (1972) derived this equation for calculating the absorbed dose rate in air at a height of 1.0 m above the ground from measured radionuclide concentrations in environmental materials. [Table 1] illustrates the specific activity of the natural radionuclide ( 226 Ra, 232 Th, and 40 K) in the sample rocks and soil collected from the area under investigation. The specific activities are given throughout the paper in Bq/kg dry weight. The table also lists the type of rock. The mean activity of 226 Ra was found to range from 21.1 ± 4 to 33.3 ± 2.4 Bq/kg with an average value of 26.6 ± 2.9 Bq/kg in rocks (region A), and from 10.3 ± 1.3 to 22.1 ± 2.6 Bq/kg with an average value of 16.98 ± 3.4 Bq/kg (region B). The corresponding values are from 23.9 ± 4.5 to 69.3 ± 4.6 Bq/kg with an average value 48.2 ± 4.4 Bq/kg for soil. 232 Th activity concentration in rock samples ranged from 19.7 ± 1 to 30.8 ± 2.5 Bq/kg with an average value of 23.2 ± 2.8 Bq/kg (region A) and from 10.5 ± 1 to 26.9 ± 4 Bq/kg with an average value of 15.1 ± 2.5 Bq/kg (region B). For soil, the corresponding values are from 17.5 ± 4 to 52.6 ± 5 Bq/kg with an average value of 41.7 ± 4.5 Bq/kg. 40 K values ranged from 418.4 ± 15 to 573.7 ± 22 Bq/kg with an average value of 515.6 ± 18 Bq/kg in rock samples (region A) and from 144.7 ± 8.5 to 467.8 ± 19 Bq/kg with an average value of 283.8 ± 13.6 Bq/kg, whereas the corresponding values for soil are from 504.9 ± 21 to 1229.5 ± 45 Bq/kg with an average value of 939.1 ± 36 Bq/kg. Baker et al. (1997)  divided the rocks into two subsets on the basis of relative age into younger and older series. The younger series includes a greater proportion of more silica-undersaturated and alkaline rocks than the older series. It is worth noting that Baker et al. (1997)  stated that light rare earth elements, Th, U and K, among other trace elements are generally higher in abundance in the young series compared to the old series at a specific MgO content. This is reflected by the results of the present study [Table 1] showing activity concentration averages for the younger rocks nearly twice as those for the older ones. Natural radioactivity is present in soil and concentrations may be changed by anthropogenic activities (like the use of fertilizers) and transported from one place to another into the ground by the rain or by wind. For this reason, results show an increase of activity concentration of 226 Ra, 232 Th and 40 K for soil rather than rocks. The activity concentrations of 226 Ra, 232 Th and 40 K in rocks and soil samples from studied area were compared with those from similar investigations in other countries and summary results are given in [Table 2]. Bellia et al. studied the natural radioactivity in volcanic island (Ustica), Italy, and the concentration of 226 Ra, 232 Th and 40 K in the basalt rocks ranged from 15 to 164 Bq/kg, from 16 to 174 Bq/kg and from 201 to 1350 Bq/kg, respectively. Batra et al. determined the natural radioactivity in geological matrices around Kaiga environment; the activity concentration in rocks ranged from 1.2 to 14.2 Bq/kg, from 0.5 to 11.5 Bq/kg and from 14.8 to 866.2 Bq/kg for 226 Ra, 232 Th and 40 K, respectively; for soil, the corresponding values ranged from 12.8 to 42.2 Bq/kg, from 19.8 to 45.3 Bq/kg and from 135.8 to 344.6 Bq/kg for 226 Ra, 232 Th and 40 K, respectively. El-Arabi et al. studied the natural radioactivity in some powdered granite rocks; the data showed the concentration values of 226 Ra, 232 Th and 40 K to range from 102 to 640 Bq/kg, from 56 to 161 Bq/kg and from 774 to 1234 Bq/kg, respectively. Also, they investigated variation of radium and thorium with the associated elements, and found the increase in the concentration of 226 Ra and 232 Th with increase in the Fe 2 O 3 , FeO, Al 2 O 3 , TiO 2 , SiO 2 , Na 2 O and K 2 O elements. El-Aydarous  studied the radioactivity levels and their corresponding external exposure of some soil samples from Taif, Saudi Arabia. The soil activity ranged from 13 to 33 Bq/kg, from 11 to 27 Bq/kg and from 129 to 230 Bq/kg for 226 Ra, 232 Th and 40 K, respectively. Similar investigations in other countries are also compared with the present study (Ahmed et al.,  Nagdia,  Al-Jundi et al.,  Akhtar et al.,  Tzortzis et al. and Narayana et al. ). 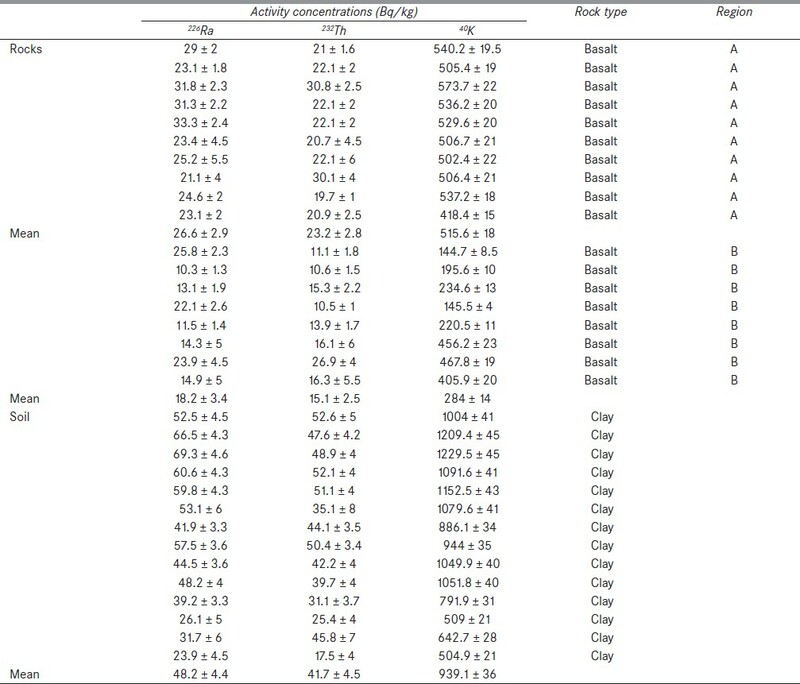 [Table 3] shows the comparison of radium equivalent Ra eq , representative level index I r, external hazard index Hex and radiation dose rate for rocks and soils from quaternary volcanism of Sana'a, Yemen, with the results in many countries (Bellia et al.,  Abbady,  Yaboah et al.,  Patra et al.,  Khaled,  Abdul Jabbar et al.,  Ziqiang et al.,  Malanca et al. and Mustapha et al. ). It can be seen that values of radiological parameter and radiation dose rate for rocks obtained from this study fall within the lowest side of all reported values from other countries except in the case of Egypt (Bir El-Sid). In contrast, values of radium equivalent Ra eq , representative level index I r, external hazard index Hex and radiation dose rate for soil obtained in this study matched with those of other countries. Rock samples and surface soil of the quaternary intraplate volcanism north of Sana'a (Yemen) were measured for their radioactivity content. The results show that the mean concentration values of 226 Ra, 232 Th and 40 K in rocks were 26.6 ± 2.9, 23.2 ± 2.8 and 515.6 ± 18 Bq/kg, respectively, for region A, and 16.98 ± 3.4, 15.1 ± 2.5 and 283 ± 13.6 Bq/kg, respectively, for region B, while that of surface soil were 48.2 ± 4.4, 41.7 ± 4.5 and 939.1 ± 36 Bq/kg, respectively. Also, the results showed that the radioactivity of region A was higher than the radioactivity of region B. On the other hand, the radioactivity of soil samples was higher than the radioactivity of rock samples. The mean values of radium equivalent activity (Ra eq ) , representative level index I r, and external hazard index Hex for rock samples under investigation were 82.2 Bq/kg, 0.3 and 0.2, respectively, while that of surface soil were 180.1 Bq/kg, 0.7 and 0.5, respectively. The results indicate that the dose rates at 1 m above the ground from terrestrial sources in all samples under investigation were 38.39 and 86.89 nGy/h for rocks and surface soil, respectively, which present no significant health hazards to humans. These values agree with the worldwide average concentrations of these radionuclides in soils reported by UNSCEAR,  which is in the range 24-160 nGy/h. These values present no hazards to humans. 1. UNSCEAR; United Nations Scientific Committee on the Effects of Atomic Radiation: 2000. Sources, Effects and Risks of Ionizing Radiation, United Nations, New York. 2. Baker JA, Menzies MA, Thirlwall MF, Macpherson CG. Petrogenesis of Quaternary Intraplate Volcanism, Sana'a, Yemen: Implications for Plume-Lithosphere Interaction and Polybaric Melt Hybridization. J Petrol 1997;38:1359-90. 3. Davison I, Al-Kadasi M, Al-Khirbash S, Al-Subbary AK, Baker J, Blakey S, et al. 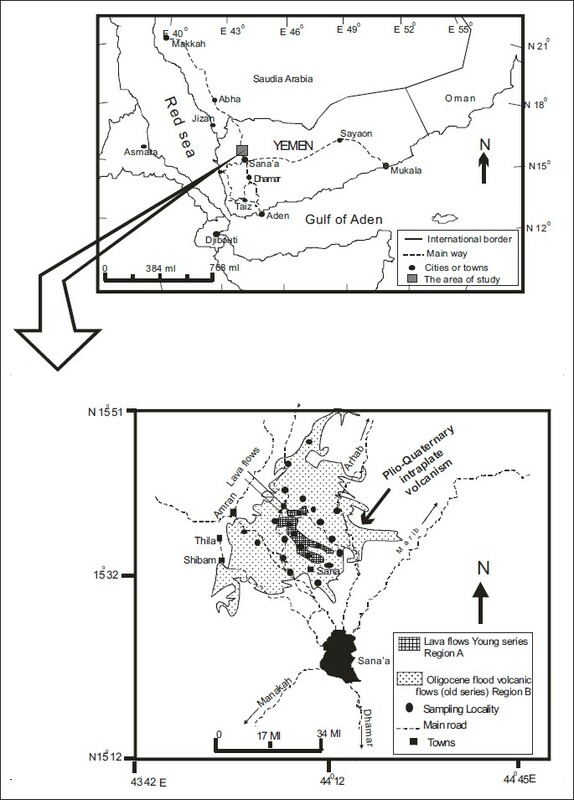 Geological Evolution of the South-eastern Red Sea Rift Margin: Republic of Yemen. Geol Soc Am Bull 1994;106:1474-93. 4. Walley El-Dine N, El-Sharshaby A, Ahmed F, Abdel-Haleem AS. Measurement of Radioactivity and Radon Exhalation Rate in Different Kinds of Marbles and Granites. Appl Radiat Isot 2001;55:853-60. 5. Aziz A. Methods of Low-level Counting and Spectrometry Symposium. Berlin; 1981. p. 221. 6. Krisiuk EM, Tarasov SI, Shamov VP, Shalak NI, Lisachenko EP, Gomelsky LG. A Study of Radioactivity in Building Materials. Research Institute for Radiation Hygiene, Leningrad, 1971. 7. Beretka J, Mathew PJ. Natural Radioactivity of Australian Building Materials. Industrial Wastes and By-Products. Health Phys 1985;48:87-95. 8. NEA-OECD, Nuclear Energy Agency. Exposure to Radiation from Natural Radioactivity in Bulding Materials. Report by NEA Group of Experts OECD, Paris, 1979. 9. Alam MN, Chowdhury MI, Kamal M, Ghose S, Ismal MN. The 226 Ra 232 Th and 40 K Activities in Beach Sand Minerals and Beach Soils of Cox's Bazar, Bangladesh. J Environ Radioact 1999;46:243-50. 10. Beck HL, Decompo J, Gologak J. In Situ Ge(Li) and NaI(Tl) Gamma Ray Spectrometry. Health and Safety Laboratory AEC. New York: Repor HASL; 1972. p. 285. 11. Bellia S, Brai M, Hauser S, Puccio P, Rizzo S. Natural Radioactivity in a Volcanic Island: Ustica, Southern Italy. Appl Radiat Isot 1997;48:287-93. 12. Patra AK, Sudhakar J, Ravi PM, James JP, Hegde AG, Joshi ML. Natural Radioactivity Distribution in Geological Matrices around Kaiga Environment. J Radioanalyt Nucl Chem 2006;270:307-12. 13. El-Arabi AM, Ahmed NK, El-Kamel AH. Gamma Spectroscopic Analysis of Powdered Granite Samples in Some Eastern Desert's Areas. Fifth Radiation Physics Conference, 5-9 November 2000, Cairo-Egypt. 14. El-Aydarous A. Gamma radioactivity Levels and their Corresponding External Exposure of Some Soil Samples from Taif Governorate, Saudi Arabia. Glob J Environ Res 2007;1:49-53. 15. Ahmed NK, Abbady A, El-Arabi AM, Michel R, El-Kamel AH, Abbady AG. Comparative Study of the Natural Nadioactivity of Some Selected Rocks from Egypt and Germany. Indian J Pure Appl Phys 2006;44:209-15. 16. Nagdya M. Ibrahiem. Radioactive Disequilibrium in the Different rock types in Wadi Wizr, the Eastern Desert of Egypt. Appl Radiat Isot 2003;58:385-92. 17. Al-Jundi J, Al-Bataina BA, Abu-Rukah Y, Shehadeh HM. Natural Radioactivity Concentrations in Soil Samples along the Amman Aqaba Highway, Jordan. Radiat Measurements 2003;36:555-60. 18. Akhtar N, Tufail M, Ashraf M, Iqbal M. Measurement of Environmental Radioactivity for Estimation of Radiation Exposure from Saline Soil of Lahore, Pakistan. Radiat Measurements 2005;39:11-4. 19. Tzortzis M, Svoukis E, Tsertos H. A Comprehensive Study of Natural Gamma Radioactivity Levels and Associated Dose Rates from Surface Soils in Cyprus. Radiat Prot Dosimetry 2004;109:217-24. 20. Narayanq Y, Somashekarappa HM, Karunakara N, Avadhani DN, Mahesh HM, Siddappa K. Natural Radioactivity in the Soil Samples of Coastal Karnataka of South India. Health Phys 2001;80:24-33. 21. Abbady AG. Natural Radioactivity of Rocks and Building Materials and its Relevance for the Radiation Exposure Due to Radon. Ph D. Thesis, South Valley University 2002. 22. Yaboah J, Boadu M, Darko EO. Natural Radioactivity in Soils and Rocks within the Greater Accra Region of Ghana. J Radioanalyt Nucl Chem 2001;249:629-32. 23. Khaled SA. Radioactivity Measurements of Some Environmental Samples Collected from Elba Protective Area, South Estern Desert -Upper Egypt. Ph D. Thesis, South Valley University 2006. 24. Jabbar A, Waheed A, Arshad SB, Syed SA, Saeed-ur-Rahman, Muhammad D. Measurement of Soil Radioactivity Levels and Radiation Hazard Assessment in Mid Rachna Interfluval region, Pakistan. J Radioanalyt Nucl Chem 2010;283:371-8. 25. Ziqiang P, Yang Y, Mingqiang G. Natural Radiation and Radioactivity in China. Radiat Prot Dosimetry 1988;24:29-38. 26. Malanca A, Pessina V, Dallara G. Assesment of the Natural Radioactivity in the Brazilian State of Rio Grande Do Norte. Health Phys 1993;65:298-302. 27. Mustapha AO, Narayana DGS, Patel JP and Otwoma D. Natural Radioactivity in Some Building Materials in Kenya and the Contributions to the Indoor External Doses. Radiat Prot Dosimetry 1997;71:65-9. Li, Z.-X., He, M.-Y., Peng, B.
Kerur, B.R. and Rajeshwari, T. and Siddanna, R. and Kumar, A.S.